It's time for the seasonal LOVE your skin event - Fall into a great complexion and more! 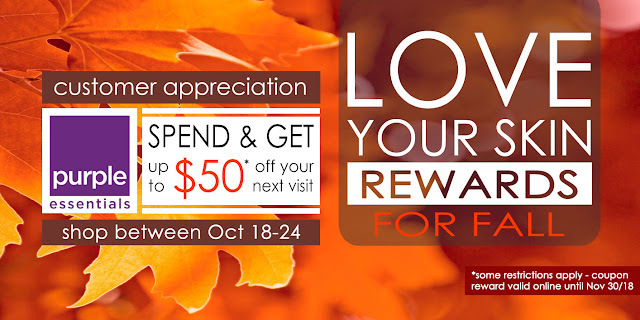 As a small thank you for helping make this year our most successful yet, Purple Essentials is happy to announce Love Your Skin Rewards For Fall. We don't think of it as a discount on our product, we consider it a reward for your loyal support. LIVE PURPLE - LIVE WELL! Shop in-store or online at purple-essentials.com before midnight PST on October 24th - Spend $* in a single transaction - Receive a corresponding coupon code for your next online purchase ... it's that pure and simple! *$'s spent in a single, in-store or online purchase - rewards based on total before taxes & shipping and net of any other applicable discounts. Corresponding online Coupon Code valid until November 30, 2018. Coupon Code, along with redemption instructions, will be delivered in a separate email following online transaction. As the weather gets cooler and your skin begins to show the effects of the changing season, Relax, Breathe Deeply and Brighten your complexion with a little self-care … an October DIY Tea Steam Facial! Such an easy and effective way to keep your skin looking and feeling its best - this could easily turn into a Sunday evening ritual. Treating your skin to a tea steam facial will result in some wonderful skin and self-care benefits - Pull back your hair, lean over a pot or bowl of steaming herbal tea and enjoy this luxurious DIY steam facial. Steaming your face helps open your pores, making it easier to remove environmental residue and congestion from your skin. By creating your own DIY steam with herbal teas, you choose which ingredients you are using and inhaling (enjoy this added aroma-therapeutic bonus). 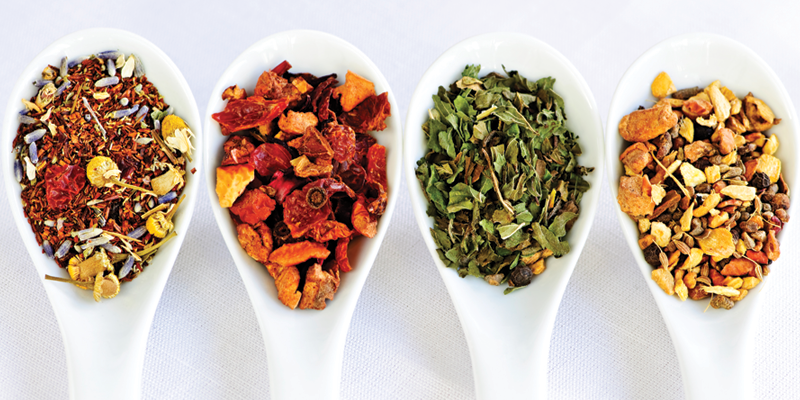 You can use single teas or create your own herbal tea combo ... I always like to set a little mixture aside for brewing a cup to enjoy while relaxing after my facial steam 😉. 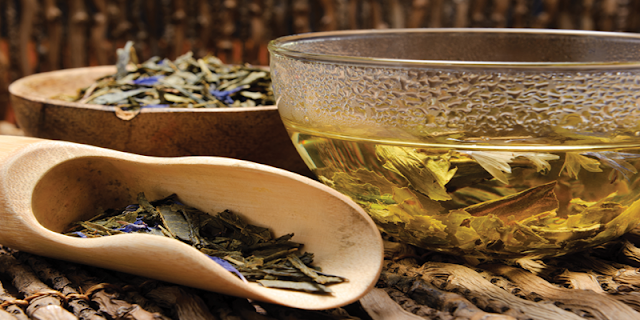 Green Tea – rich in tocopherols, ascorbic acid, flavonoids, antioxidants, carotenoids and selenium. Green tea is a wonderful choice for a healthy glow. 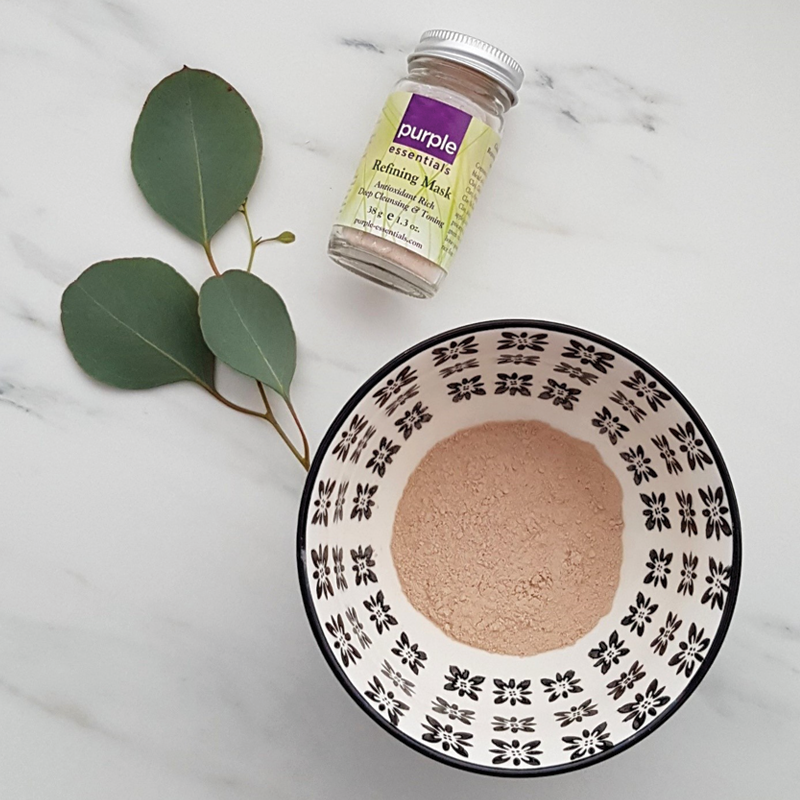 Rooibos – works well for skin suffering with acne. It has antibacterial, antioxidant, and immune-modulating properties. These provide protection against free radicals and any harmful damage to the skin. Peppermint – antioxidant and anti-fungal properties that helps to prevent oxidative damage to the skin. Helpful in balancing oil production and stimulating circulation (also helps to clear sinuses and stimulate senses). Jasmine – with it’s beautiful scent, actually has antiviral and antibacterial properties to keep your immune system healthy. It can help prevent the signs of aging and soothe skin conditions like eczema and acne by reducing oil production and balancing hormones. The options are really endless here - mix and match to your pleasure. You can also throw in rose petals, herb leaves, lemon slices, orange slices, and/or drops of your favorite essential oil to really customize the experience. Create your beautifying tea combination as above (approx. 2-4tbsp.). Bring 4 cups of water to a boil in a medium saucepan. Select which tea you’ll be using and add to your water. You may use loose or bagged tea, but I recommend pouring the contents out of the tea bags because it's mesmerizing watching the dried petals and leaves floating around. My favourite blend mixes 1 packet or tablespoon of chamomile & 1 packet jasmine green tea with 2 drops lavender essential oil and 2 slices of lemon. These specific ingredients create a deep cleansing, soothing and skin-balancing steam that has a very relaxing and uplifting aroma - heaven! Once your water is boiling, add your special ingredients and remove from heat and allow to steep for 5 mins before you begin your herbal tea steam. While your brew is steeping, prep your skin. Gently remove any makeup or creams you are wearing and secure your hair back from your face. When the brew has steeped, set your hot pot on towel or pour your herbal tea water into a heat-safe bowl and place it on a sturdy surface that you can easily pull up a chair to. Cover your head with a towel and lean over your pot/bowl. At first, try to keep at least 12 inches between you and the hot tea—the steam should not sting your skin. As the steam becomes cooler, you may lean in closer. Your steaming time can last anywhere between 15 and 30 minutes. Don't forget to breathe deeply, experience the aromatherapy of your DIY handpicked blend of teas. Let everything else go and embrace your very own Spa treatment. Applying a facial mask following your steam helps you reap the maximum benefits for your efforts. Think of your skin like this - moist skin is like the soil after a light rain—more absorbent to nutrients and treatments. Our Recommendation - this the perfect time to use Purple Essentials' Refining Mask. To enhance the full DIY facial experience and increase skin's hydration, take a few extra moments to gently massage in your favourite moisturizer. Our Recommendation - antioxidant-rich Facial Elixir and/or Rejuvenating Serum to best hydrate and moisturize your soft and supple skin. Live pure and simple - Live Purple! !